WHILE some people battle with one disease at a time, a person who suffers from the rare Ehlers-Danlos Syndromes has to endure several conditions at the same time. The conditions range from dislocating joints, bruising skin, poor eyesight, fatigue, frequent collapsing and insomnia as well as amnesia being just some of the symptoms of Ehlers-Danlos Syndromes. Ehlers-Danlos Syndrome are a group of disorders that affect connective tissues supporting the skin, bones, blood vessels, and many other organs and tissues, and has a prevalence rate of 1 in 5 000 people. The 27-year-old Nthabeleng Ramoeli, a Lesotho national who studied in Namibia, was born with the Ehlers-Danlos Syndromes. It was not until 2012 that the doctors diagnosed the disease. Ramoeli said she first experienced poor eyesight, and at the age of three, she had to start wearing glasses. “I could not see, and my mother thought I simply liked watching television up close, until I walked right into a swing at school. This was when it was realised that I had poor eyesight,” she recalled. This did not trigger any concern from her parents, although she showed other signs such as bruising skin and fatigue. “Nobody took these signs seriously. Everyone thought I was just a lazy and clumsy child, who would always hurt herself and got tired easily,” she added. When she turned 12, her condition worsened, and her joints started dislocating. “The first time this happened, I was at school, and my jaws just dropped. This was the most painful experience of my life, and I don’t remember how I managed to put it back in place. I remember being in intense pain,” remembered Ramoeli. Ramoeli dealt with dislocating joints throughout her high school years, and doctors could not tell what was wrong with her. 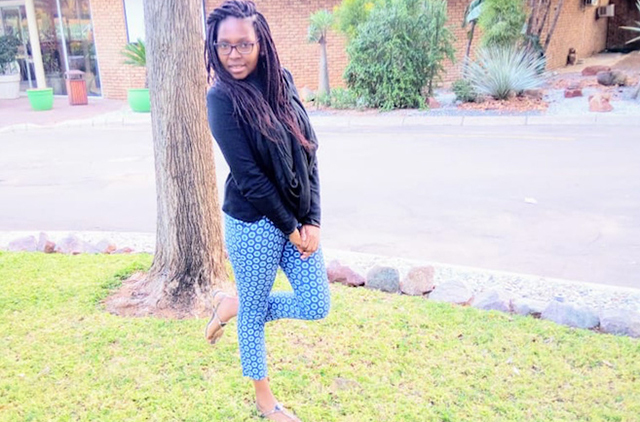 She moved to Namibia to do property studies at the Namibia University of Science and Technology, and it was not long after this that her condition deteriorated even further.